Finally! 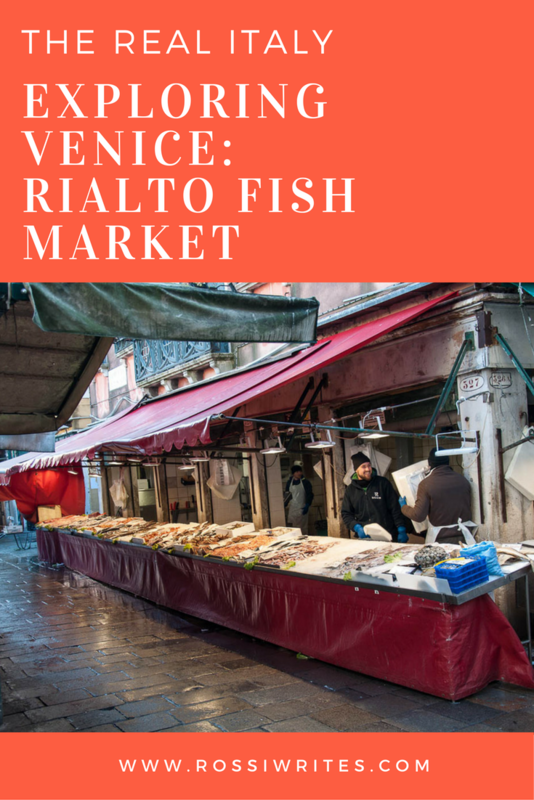 I was at Rialto Fish Market in Venice and it was better than I have ever imagined it to be. 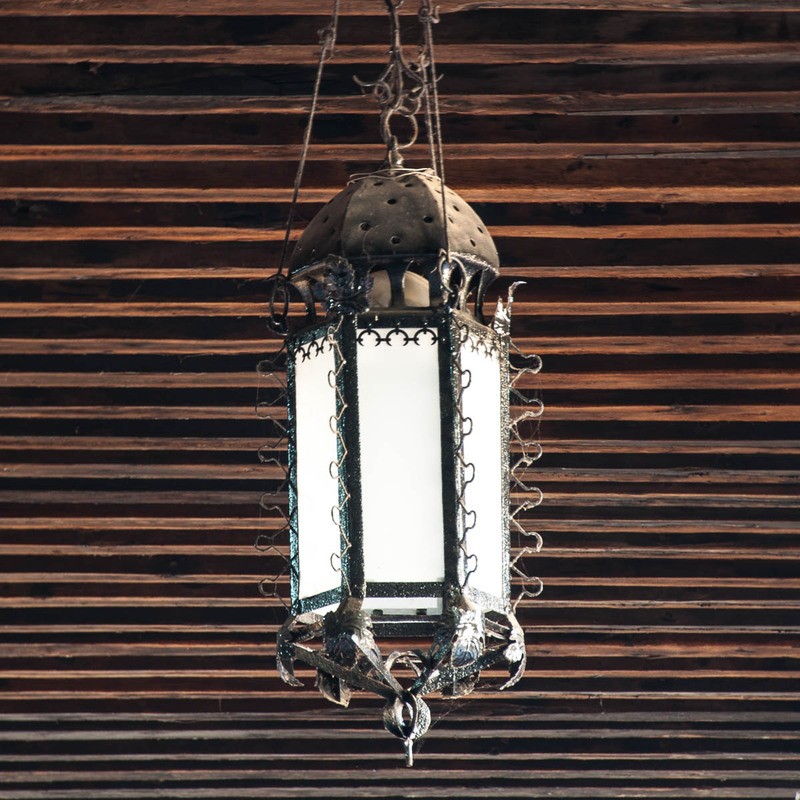 For the past year visiting this lively and historical place in La Serenissima had become a personal obsession of mine. Yet no matter how hard I tried and how many times I returned to Venice with the intention to see it on that particular day, somehow I always managed to reach its Neo-Gothic market halls either right after the end of the trading day or it would turn out to be a day on which the market wasn’t open at all. 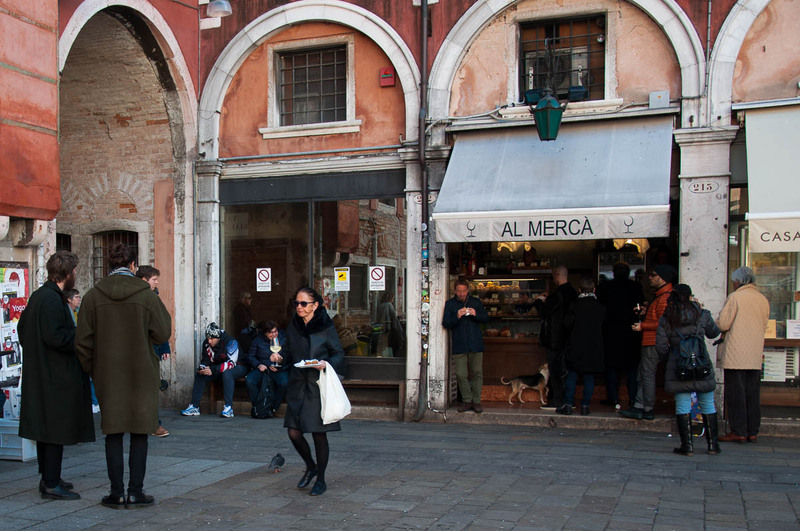 Once I even carefully crafted a day visit to Venice to be undertaken by us and friends. According to my plan the fish market was to be the first highlight of our day. So, I dragged us all (buggies, bags, four adults and three kids) from Santa Lucia train station down to the Santa Sofia traghetto stop from where we were supposed to take the traditional gondola-like ferry (called traghetto) for the two-minute crossing of the Grand Canal in order to arrive at Rialto Fish Market in proper Venetian style. ‘It’s Sunday!’, said the gondolier waiting for clients at the adjacent gondola dock. 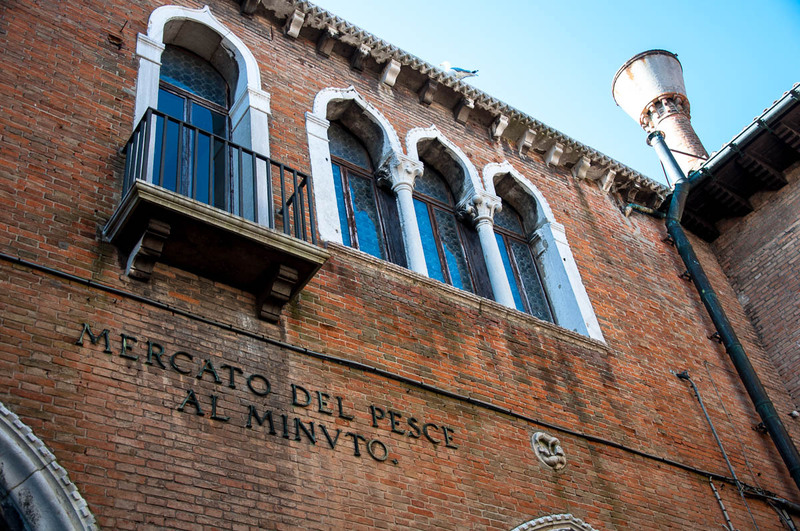 ‘The traghetto is stopped for repairs and also the fish market is not open on Sundays at all!’, he explained. ‘Oh, it says many things on the internet!’, the gondolier exclaimed, then he shrugged as if to say: ‘These things happen!’ and went back to chatting with his mate. I was left both disappointed and stressed, simultaneously vowing that this would be the last time I plan a day out for so many people (oh, the responsibility, I felt its heavy burden on my own back) and promising myself that rather sooner than later I would see this elusive fish market no matter what. 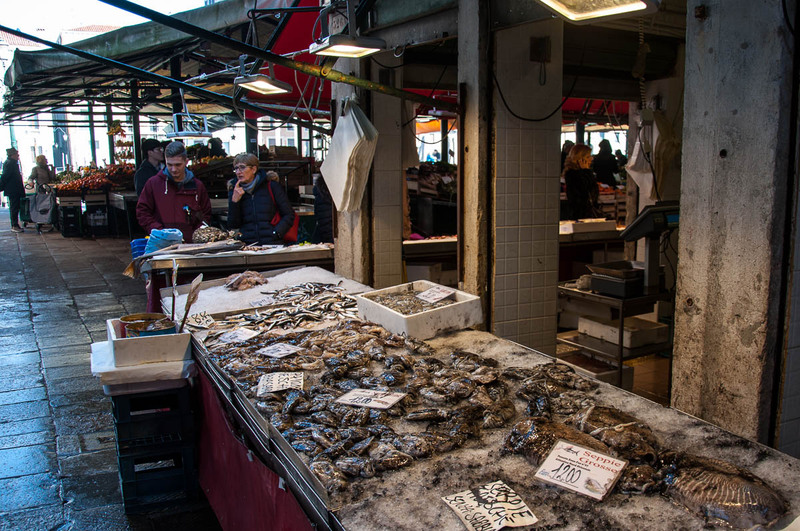 So, yes, it was now 11 am on a Thursday and even though the fish market had already slowly started to wind down, I was in its very midst and taking it all in. 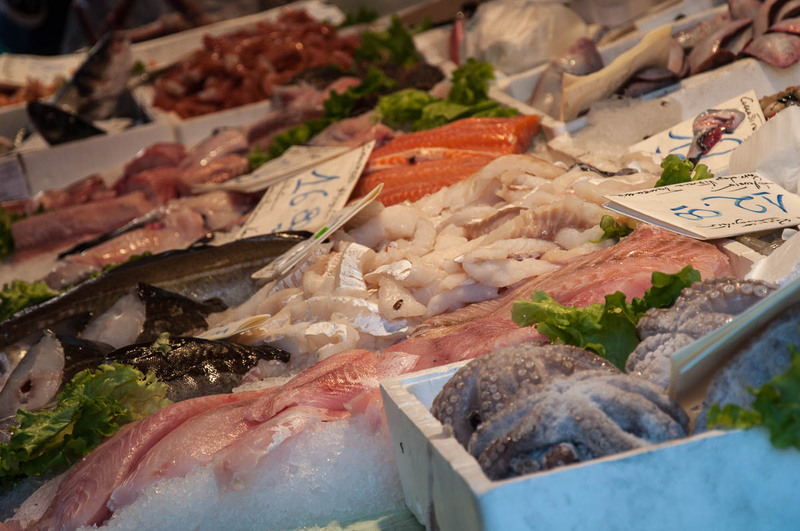 Fresh fish and seafood had been artfully arranged on stalls covered with deep layers of crushed ice. Fishmongers wearing long aprons and gloves were busy at work, wrapping fish in paper and taking orders from customers who would fastidiously make their choice. 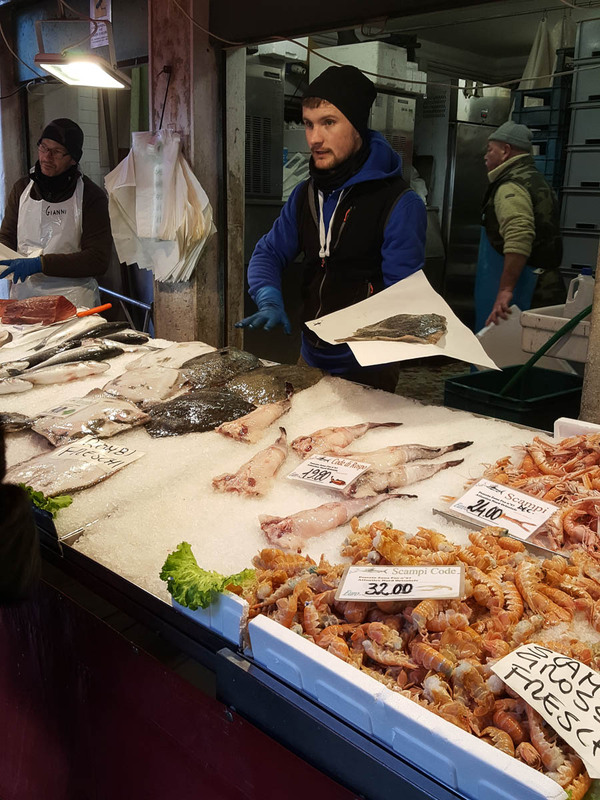 A constant trickle of people – both locals and tourists – was besieging the stalls, marvelling at the amazing shapes and colours of the fish or picking half of kilo of this and that to cook fresh at home. 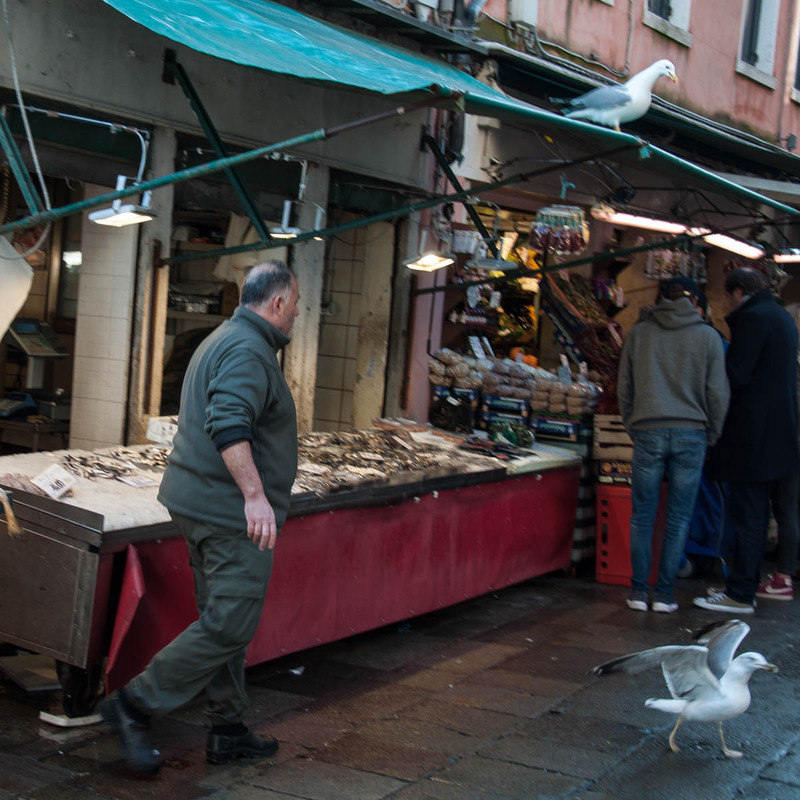 A gaggle of seagulls had taken a high vantage point stalking the fishmongers’ stalls. It was noisy and full of life. and the large one which is bisected by a straight line of tall supporting columns. 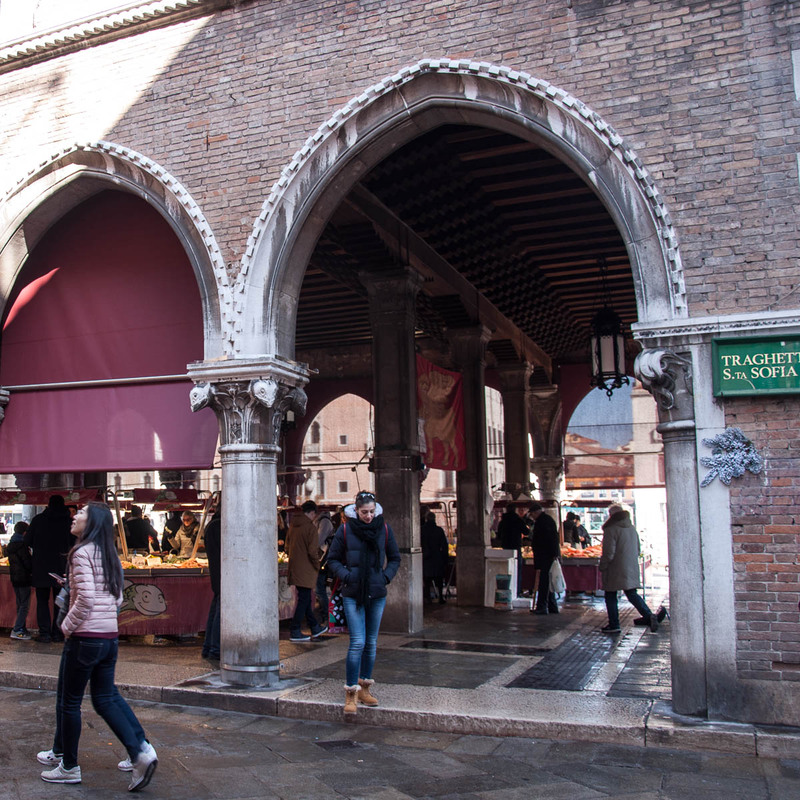 Red drapes hung in the arches of the halls, creating a temporary wall of sorts between the market scenes inside and the surrounding canals. 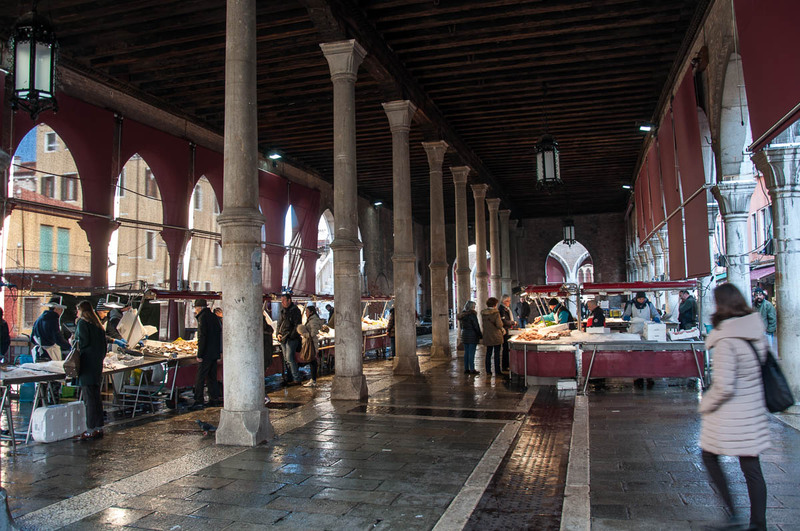 Outside, there were a few more fishmongers’ stalls, huddled on the ground floor of old and tall Venetian houses dating back to the 15th century. For sale there were such exotic for me sea creatures like squid, spider crabs and even moeche – a soft shell crab from the Venetian lagoon, a kilo of which would set you back 75 euros (see at the back of this photo). and fish that I had never seen before. 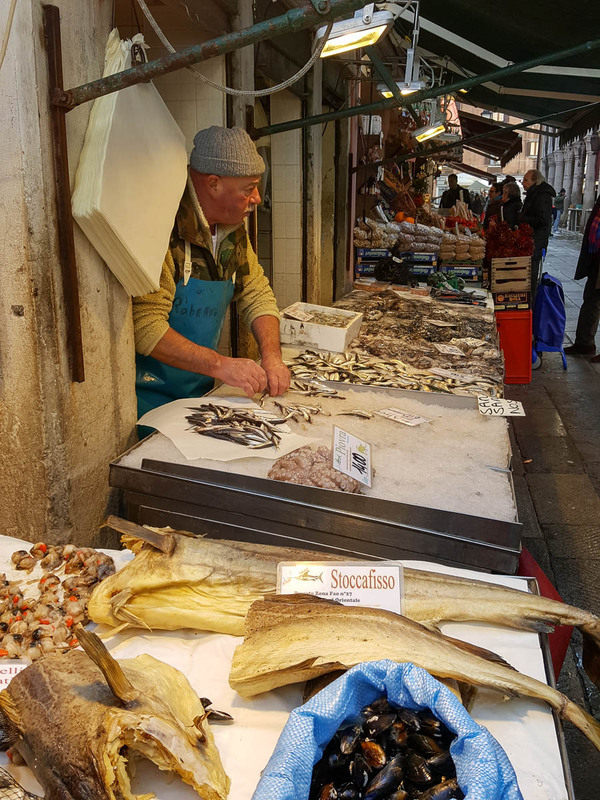 The fishmongers – young and old – were working hard. 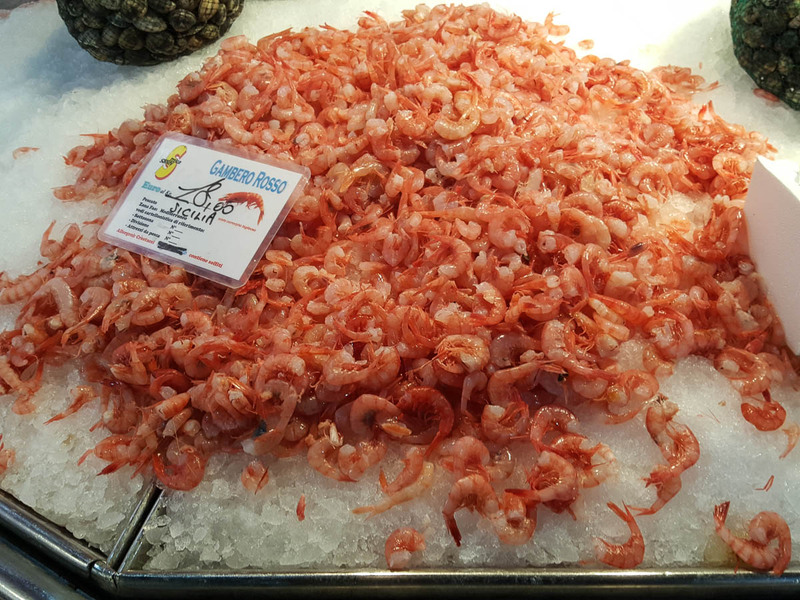 As soon as a customer would point to whatever caught his eye, the fishmonger would grab handfuls of fish or seafood and pile them on top of squares of thick white paper. Next, he would roll them into neat packs, weigh them, take the money the customer would hand him, give back the change due and be ready for the next order or two. 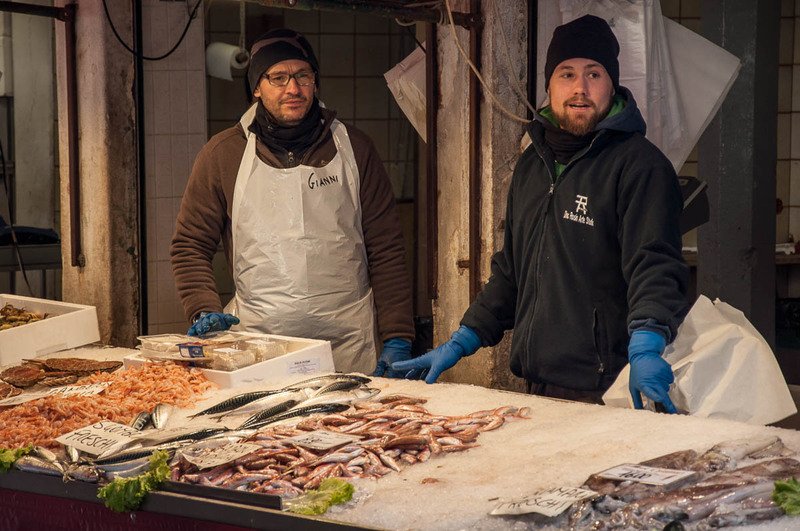 In the pauses between serving clients, the fishmongers would busy themselves by tidying up the stalls, replenishing the ice and engaging in lively chatter with each other, all seemingly in a perpetually good mood. 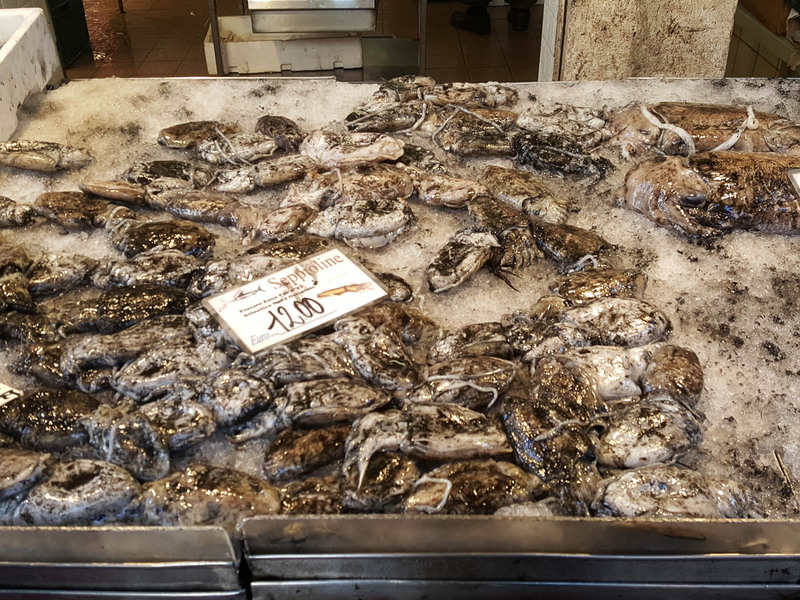 As the granddaughter of a fisherman, I find fish markets and everything related to the sea difficult to resist. My grandfather (rest in peace!) used to have a few boats, nets and a fishing team. Very early in the morning (so early in fact that it was like really late at night), they would go out and place their drifting nets in the sea, leaving them there overnight and going back early again to collect the fish. 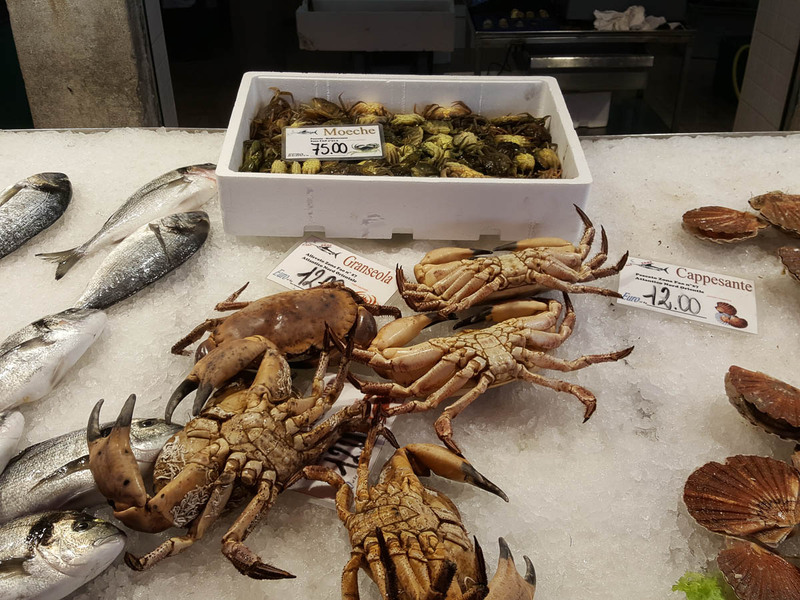 Then they would sell their fresh catch at the fish market in Varna (my home city). After the Second World War, when private property in Bulgaria was nationalised, my grandfather lost his small fishing business and had to work other jobs. Until the end of his life though he remained deeply connected to the sea. As a child, sometimes I would spend a few days with him and my granny at their home. At that time my grandfather was rather ill. I remember people popping unannounced early in the morning every now and then. They were my grandfather’s friends from his youth, the men he used to go out in the Black Sea to fish. 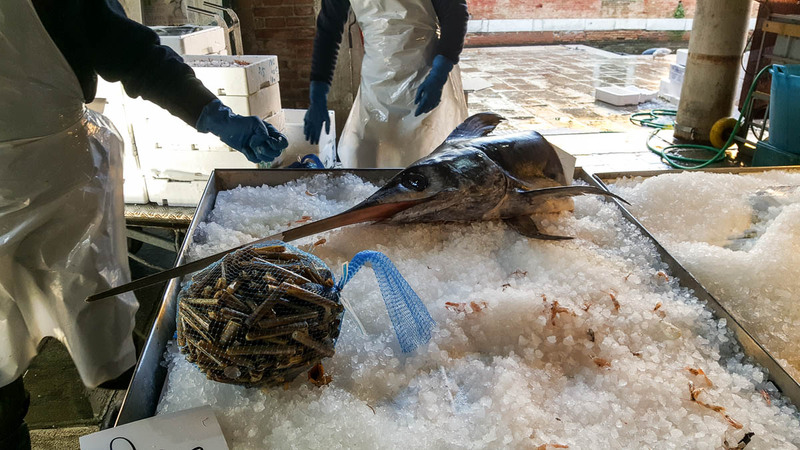 They would bring gifts for him – a large turbot just plucked out of the water, a couple of kilos of tiny sprat (which in Bulgarian is lovingly called ‘tzatza’) and (when in season) fresh mussels. My granny would retreat to her tiny kitchen, set pots with water to boil on the stove, then she would busy herself with cleaning the fish and for breakfast we would be served fragrant bowls of fish soup. Soup for breakfast?! As a child I would find this so weird. Yet, now I would give quite a lot to be able to go back and taste this soup once again. 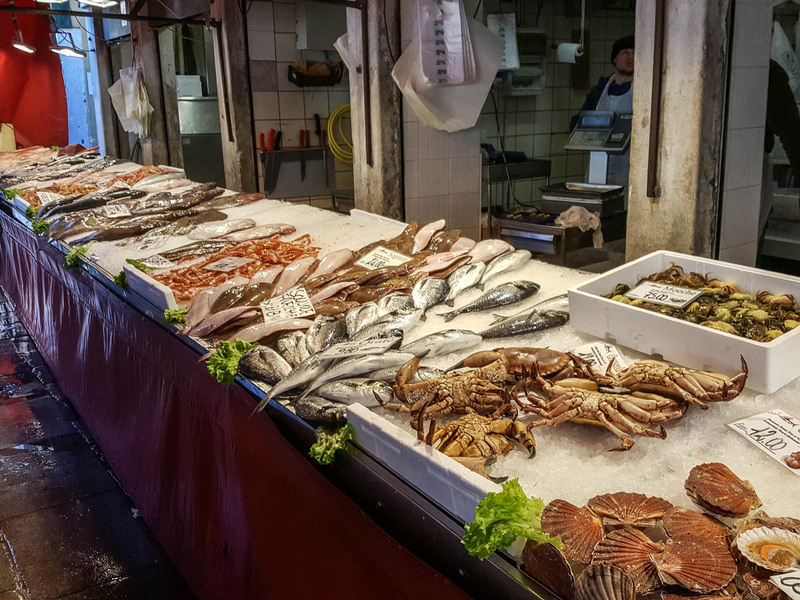 Since then, I have always loved fish and fish markets are always a place I love to visit no matter where I am. Rialto Fish Market didn’t disappoint. I found it very raw and authentic in spite of the many tourists which roamed a bit aimlessly around. 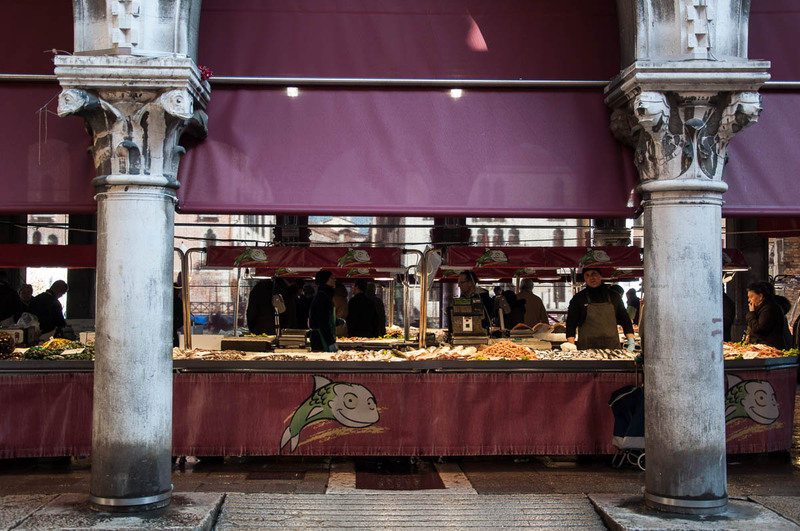 You could still see the proper Venetian men and women, all neatly dressed and purposefully browsing the stalls. 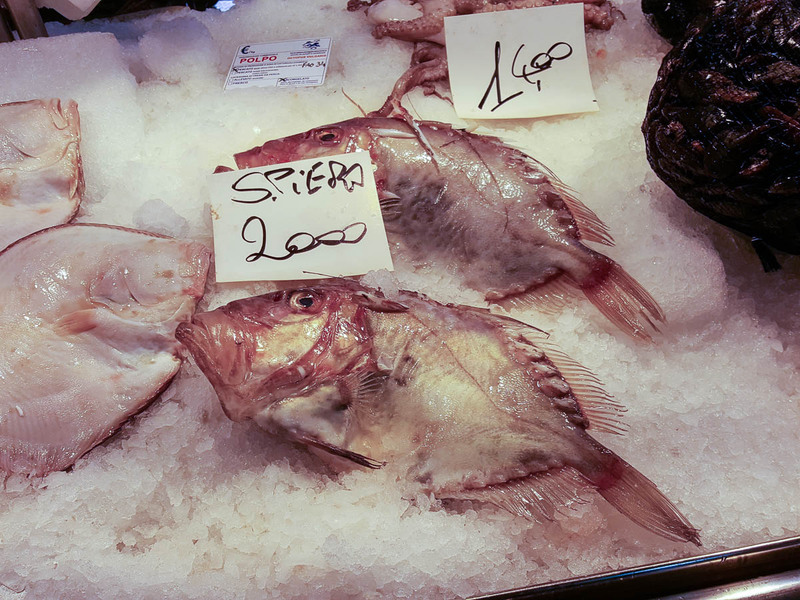 They knew exactly what they were looking for and were not shy to tell the fishmonger which turbot exactly to give them and which one to leave back on the stall. I so wanted to talk to the fishmongers, to ask them questions like: how long have you been working here, is this a family business, which one is your favourite fish, how do you prepare moeche and which local bar would you recommend that I go to nearby in order to try the best Venetian cicchetti with seafood, how early do you get in the morning in order to start your working day at the market and so on and on. Silly, simple questions, you know. But questions the answers to which I, as an outsider, wouldn’t know and which could potentially reveal a whole new world to me. At the same time, I was painfully aware that as I wasn’t going to buy anything, I would be taking up the fishmonger’s valuable time. Time that he could spend serving clients or tending to his stock. 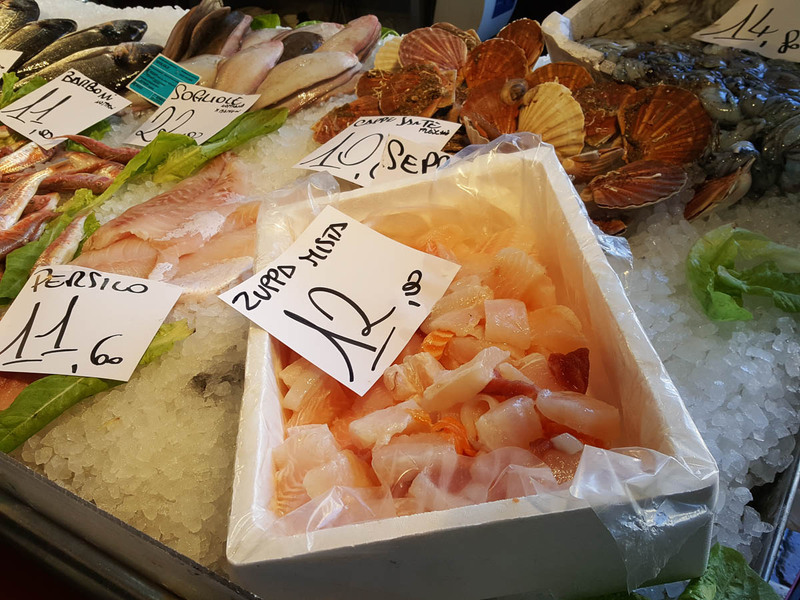 A lady customer noticed me loitering around a stall, looking indecisive, camera around my neck, and just as I was opening my mouth to speak, she chimed in, speaking in Italian to the fishmonger serving her. With my spoken Italian remaining at the broken level still, I decided not to engage. For the record, I so wanted to buy loads of everything I saw. 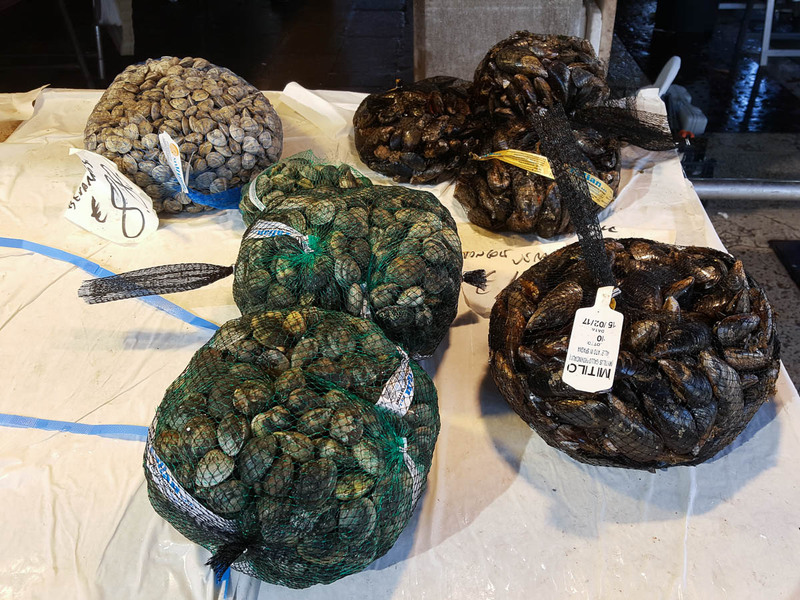 But, carrying fresh fish and seafood around Venice for the rest of the day whilst visiting museums and other such places of interest, didn’t seem like a great idea after all. 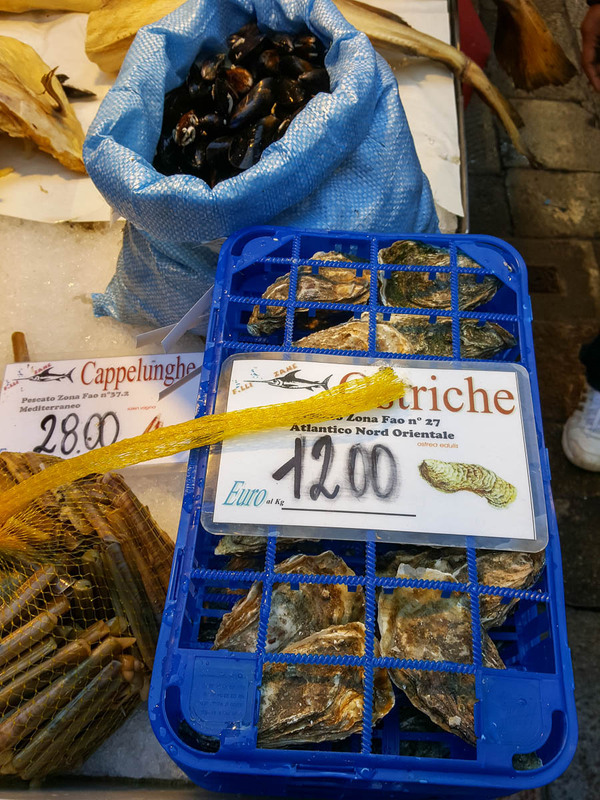 Hence, I wanted to ask for a recommendation for a nearby bar serving the traditional Venetian appetisers (called cicchetti) with seafood, so that I could support the market at least indirectly. Still, after that lady spoke, I had to leave my question for maybe some other time. 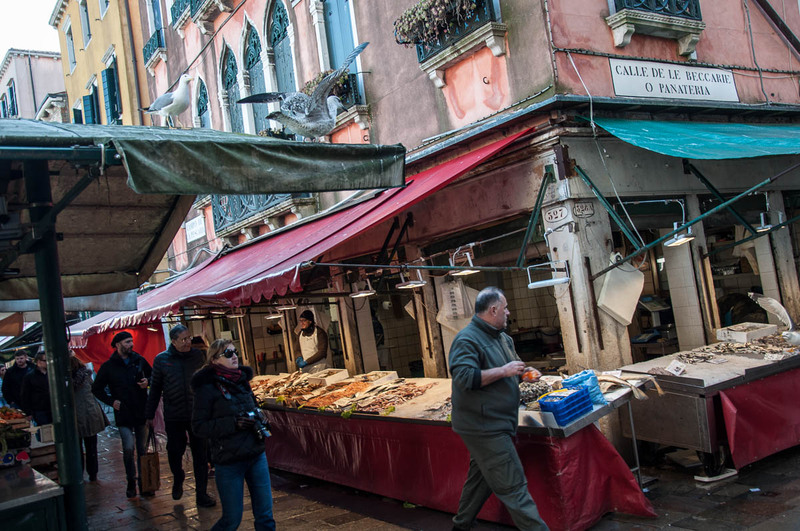 A market has been held at that particular spot in Venice for close to ten centuries. 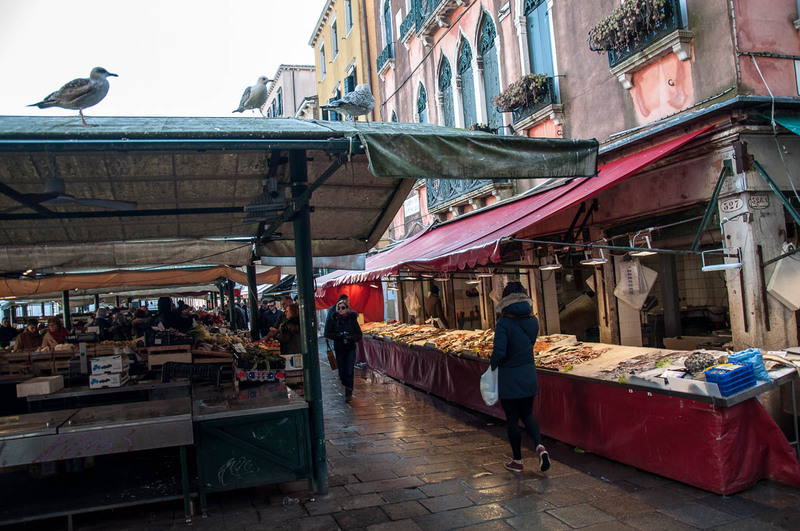 Today, the tradition is still alive and right behind the majestic Rialto Bridge and right on the side of the Grand Canal, you will find first the stalls of the fresh fruit and veg sellers which are then followed by the two market halls of La Pescaria – the fish market. 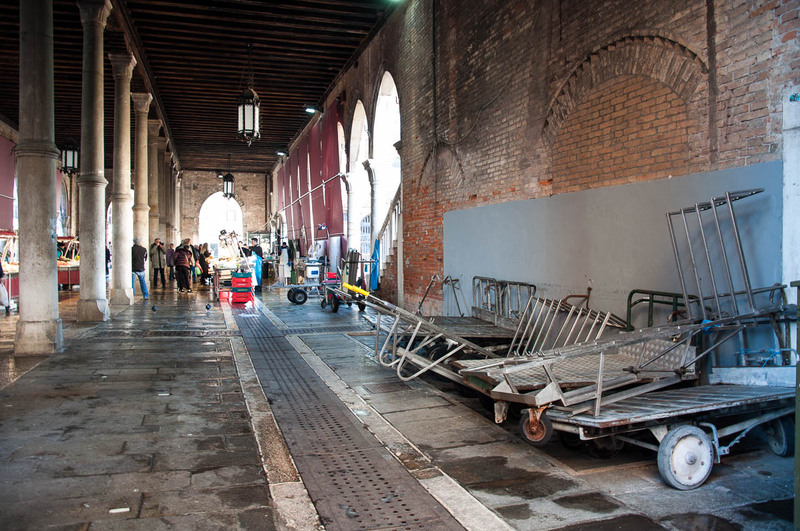 In terms of Venice’s age, the market halls are (almost) new-builds . They were erected in 1907 in the Neo-Gothic style. 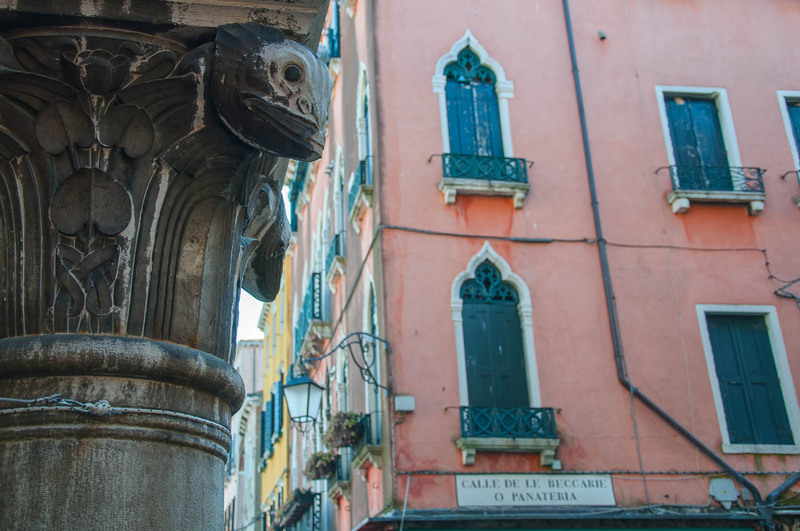 If you look closer, you will notice that the capitals of some of their supporting columns are adorned with sculptural fish. 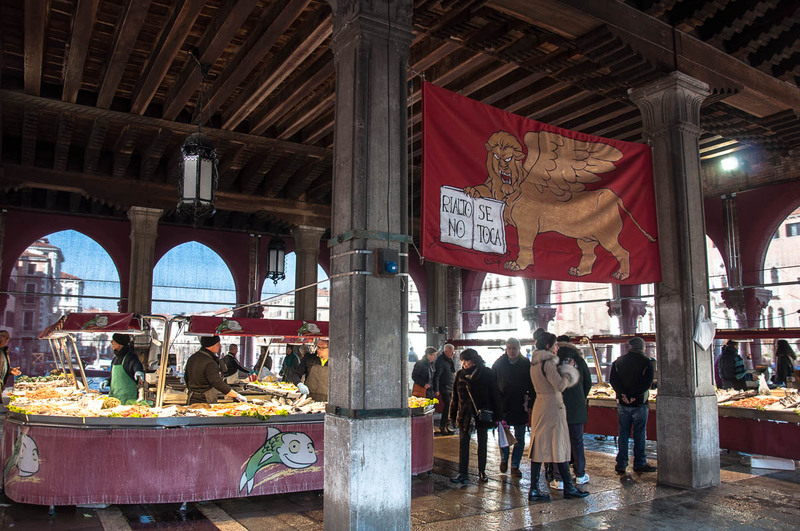 The Republic of Venice has been regulating the sale of fish since 1173 and vendors caught selling undersize fish were severely penalised. 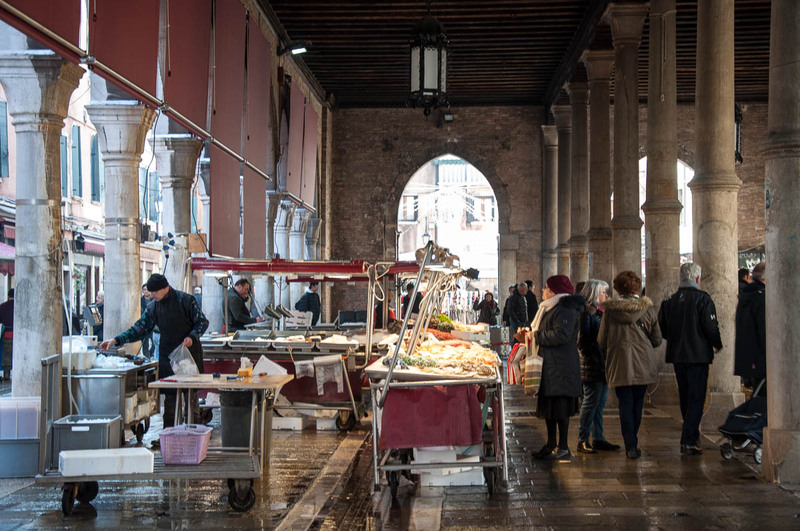 Nowadays the fish sold keeps coming straight from the Venetian lagoon (freshly and seasonally caught that same morning) as well as from other corners of the world. The boats of the fishermen dock right by the market stalls and the fishmongers use large metal trolleys to push the heavy boxes all the way to their stalls. If you happen to walk in their path (as I managed to do), they shout in Italian ‘Ferma! Ferma!‘ (Stop! Stop! ), so that you can get your bearings and get out of their way. Just then something caught my eye. The seagulls which had been carefully observing the fishmongers from the high vantage point of the awning of a nearby fruit and veg stall, got the chance they had been waiting for and attacked. 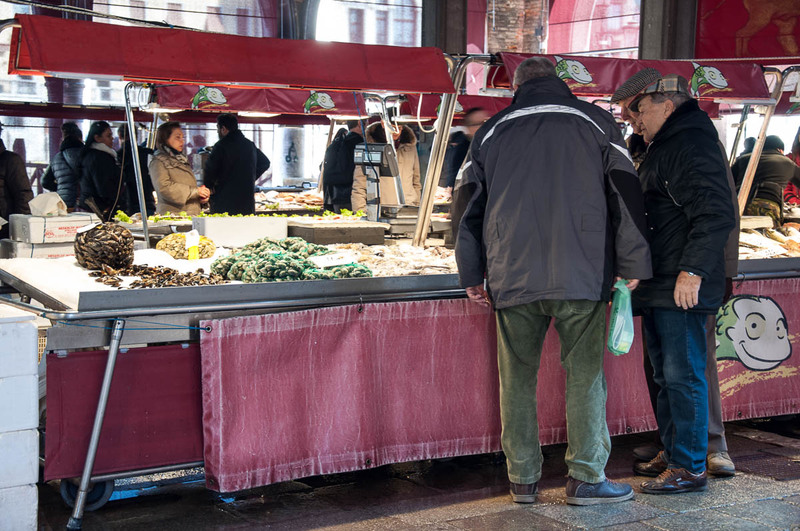 As soon as the fishmonger walked into the back of his shop, the seagulls – led by the bravest one of them all – swooped down and the leader scooped a fish straight from the stall. I snapped a quick picture, but in my haste I didn’t frame it right (among other things), so you can see half of the cheeky seagull on the right hand side. The fishmonger, angry, came rushing out. He made a sweeping motion with his arm and threw a tangerine at the seagulls. They nonchalantly walked away, then flew up and resumed their careful observation from the awning of the fruit and veg stall. I spent a few minutes looking at them, trying to gauge their next move. The seagulls acted like a squad of seasoned raiders, hardened in many attacks. Soon their leader, encouraged by them, tried to steal another fish, but this time didn’t succeed. It was time for me to leave. I stopped for a few minutes at a nearby bar – a real hole in the wall – selling tiny sandwiches and drinks. 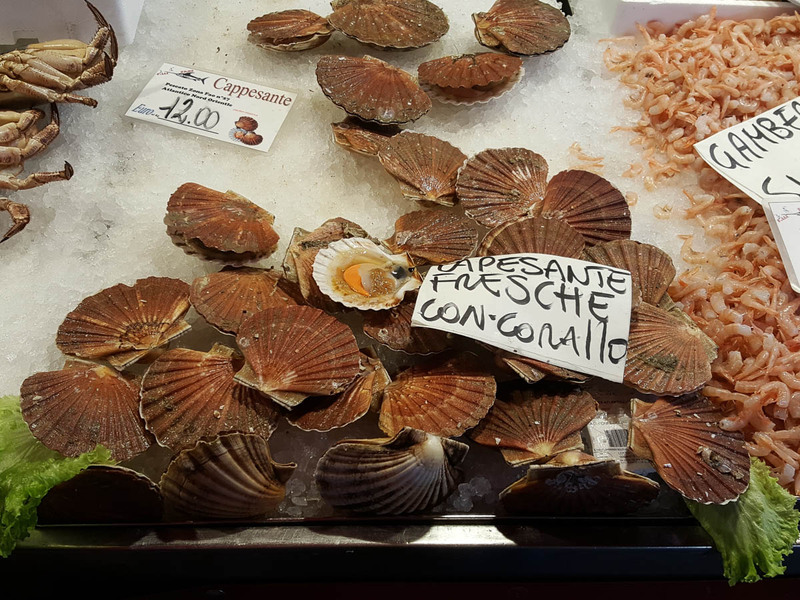 I enjoyed a lovely panino with fresh tuna and radicchio filling and glad that, finally, I had experienced La Pescaria – Rialto Fish Market – for myself, I went on my way. 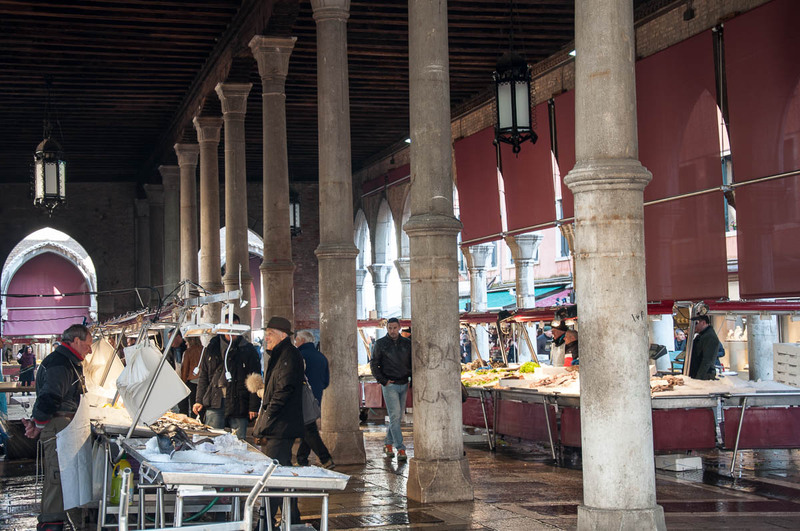 If you are in Venice, make sure that you get up early and walk to Rialto one morning in order to enjoy the hustling and bustling markets there (both the fruit and veg one and the fish market are side by side). 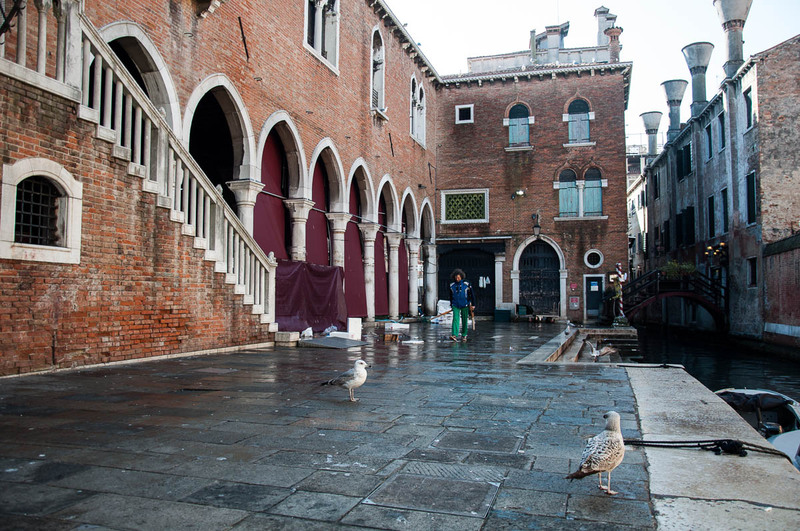 For some added effect, arrive by traghetto from the opposite side of the Grand Canal. The traghetto stop you need is called Santa Sofia. Here I have given more details as to what is a traghetto and how it operates. Don’t make my mistake to go there on a Sunday! 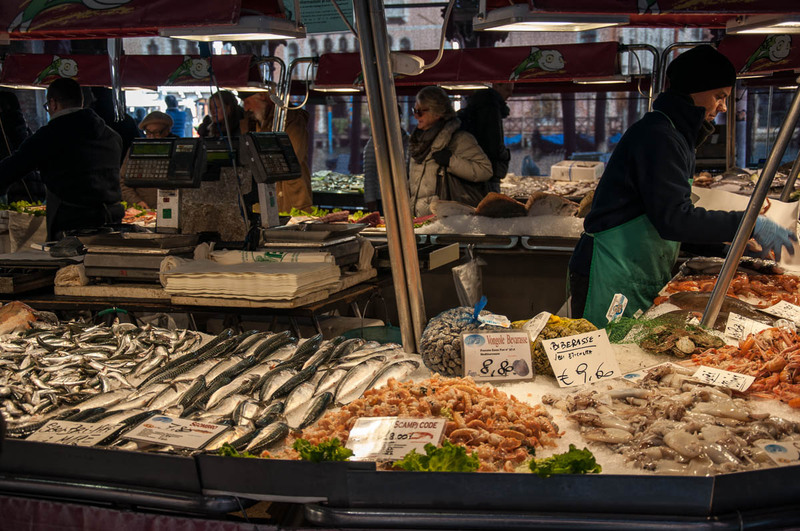 Have you been to Rialto Fish Market or any other fish market in the world? Share with me your impressions and memories below. Thank you! Hi, lovely article especially as it evoked memories of your grandfather. I too like watching local fishermen return with their catch, sometimes good sometimes bad, sadly more bad when I was recently in Croatia. Yes, there are many traditional and modern eateries around the market. Have a good time in Venice!